Yesterday, our firm found ourselves in an odd position. A case of ours was set for trial, and we were ready to go. (That’s not the odd part). The odd part is that although we were willing to waive the jury and allow the judge to make the determination of guilt, the state wouldn’t allow it. In general, the only reason the state would oppose this is because they think they would have a better chance of a guilty verdict with a jury rather than the judge. Conversely, a defense attorney would do this if they think they have a better (or equal) chance with the judge. In this case, we knew the facts of the case, and were very confident of a not guilty no matter who was looking at it. So we attempted to save our citizens some time, and let the judge decide. 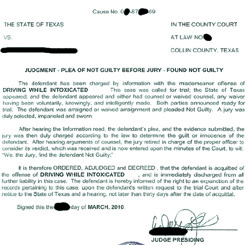 But as has recently been pointed out by the front page article in the Dallas Morning News (just one day earlier), the State has a right to a jury trial. Roach said his office does not target specific judges as some allege. "That’s an ignorant statement," he said. The law says prosecutors are entitled to demand a jury trial "and it doesn’t make any difference what our motives are." Yet avoiding specific judges seemed to be exactly what was going on in our case. It needs to be pointed out, that this specific case, the issue was not about who was going to be doing the punishing in the case (as the DMN article was about). 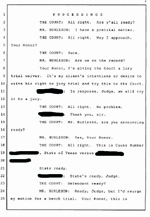 This case was about having a judge or a jury decide the verdict of guilty or not guilty. So although the quote is telling about the mindset of the District Attorney’s office — it’s not directly on point. So, instead of having the one judge decide, the State insisted on the jury. About 25 jurors were brought in for the day. Of those 25 jurors, 6 were selected for the jury and sat through a day and a half of trial. Oh yeah, the verdict? Not Guilty. I’m sure the jurors were glad to have to take off work.